Today was our day to "interview" the dogs at a new daycare. Yes, interview. They did good. The Strawberries got to meet Cassius and Kipi later today, too... very cute. We finalized everything graphics-wise for our Grand Opening on November 4th. The emails started flowing. Pretty neat seeing how many people are interested in coming to see our school. Even better to find out how many people already knew about us. Like wildfire. You'll be happy to know that we met with our fence guy today about putting up a privacy screen around the playground. That should be going up soon. For dinner, Crys and I got Whole Foods. Walking back, I suggested we sit outside on the playground. We sat at the little tables and had a nice sunset dinner while the dogs played in the yard. They can both go down the slide now. 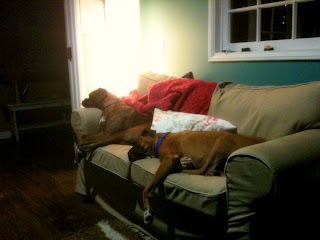 Right now, as you can see from the photo, they're worn out from a long day at work. We do sleep at home... I promise. Um, am I invited to the Grand Opening? Because I want to be. Bad.